A happy New Year, from us to you! On behalf of PESB staff and all of our Board members, we wish you a safe and restful time during the holidays and New Year. As we transition into 2019, we continue to prioritize our mission of ensuring all Washington students learn from highly effective professional educators, in all roles, within the education system. We are deeply invested in the academic success of our students, and to do this work, we must support our educators through the entire career continuum. 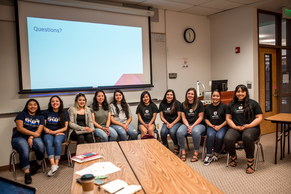 Our commitment begins with recruiting diverse educators through pathways programs, ensuring those educators enter highly effective and culturally responsive preparation programs, and supporting educators once in their role with workforce development and professional growth opportunities. This work could not happen without the help and commitment of stakeholders across the state, spanning multiple systems and organizations. In 2018, we fostered several new partnerships, and continued to grow the collaborative impact of existing ones. 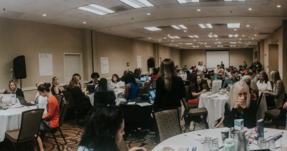 Included in these efforts was the annual Diversifying the Educator Workforce (DEW) conference, where hundreds of individuals came together for a day of engagement, conversation, learning, and action planning. Robert Hand, Washington's 2019 Teacher of the Year, engaged with two of his students on the importance of having a diverse educator workforce at the DEW conference in October. Additionally, this has been a tremendous year of growth for our organization and we are excited to see continued statewide collaboration and support for our educators. It is critical that we continue to center our focus on addressing the educator shortage, and improving teacher diversity. As you enjoy quality time with friends and family during the holidays and New Year, we hope you have opportunities to connect, and share diverse perspectives, stories and experiences from 2018. 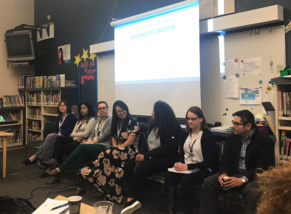 In October, we had the opportunity to listen to a panel of mentor teachers and cohorts of the Bilingual Teaching Fellows Program in Highline. We were able to attend Burlington Edison and Mount Vernon high schools for a site visit of their Recruiting WA Teachers programs. Presenters shared program overviews, changes, curriculum, and we were able to hear from a student panel. 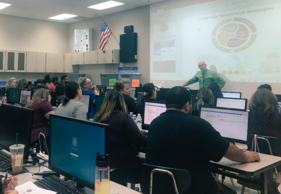 We've been traveling to all of the paraeducator pilot program sites, learning best practices on their introduction to the paraeducator standards of practice. 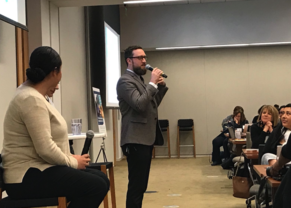 We kicked off our microcredential pilot grant, which offers up to twenty $18,000 grants to Washington school districts, district consortiums, ESDs, and clock hour providers/higher education institutions that are interested in piloting competency-based micro-credentials.